A meet of south zone segment incharges was held at party head quarters Nawa –e- Subha, Srinagar. The meet was presided by party president Dr Farooq Abdullah. Party Vice President Omar Abdullah also addressed the meet. Exuding confidence into the workers and party functionaries party president and vice president said that party has fielded the best possible candidates from three parliamentary constituencies of Kashmir who have necessary political acumen and experience. “Our candidate for south Kashmir Justice (retd.) Hasnain Masudi is a legal luminary whose pronounced judgments and articles reveal his legal acumen and dedication,” he said. The issues relating to ensuing elections were deliberated in the meet. 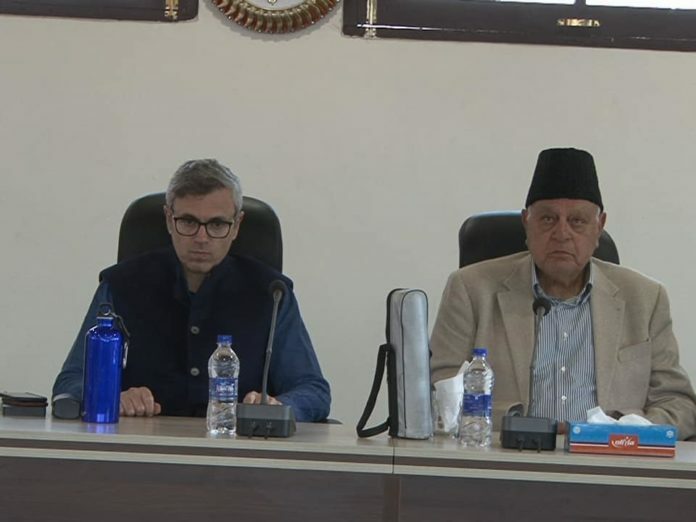 Dr. Farooq and Omar Abdullah urged the party functionaries to leave no stone unturned to ensure that Justice Masoodi wins by resounding victory. Party Vice President asked the party functionaries to remain vigilant of the machinations of the RSS-BJP and its cronies in the state. The party functionaries, segment incharges of south Kashmir vowed to strengthen the hands of Hasnain Masudi. Party’s senor leaders General Secretaries Haji Ali Muhammad Sagar, provincial president Nasir Aslam Wani, Party’s Anantnag parliamentary constituency candidate Justice Hassnain Masoodi were also present in the meet. Among others south zone president Bashir Veeri, party’s district presidents Altaf Kaloo, Showkat Hussain, Ab Majeed Larmi, Gh Mohiudin Mir, senior leaders Peer Mohammad Hussain, GN Ratanpuri, Spokesperson Imran Nabi Dar and other segment incharges were also present in the meet.